So half term has rolled around again! Luckily my husband was off Monday what with it being bank holiday so we spent it together just pottering around and hubby kind of took control whilst I just sat back (ahh bliss lol). We stayed at home in our pyjamas Tuesday and watched dvds and ate biscuits all day Tuesday (now this is my kind of day lol!!) Then Wednesday visited James nanny and grampy for the afternoon. Yesterday James had his swimming lesson which he LOVES! he is coming on so well with it now and confidently goes under the water all by himself and has really improved his techniques for front and back strokes and the teachers have all made comment about how much his confidence has grown. After swimming yesterday I popped into our local \£1 shop although after 3 pound shops popped up in our small shopping center they now all appear to be 97p shops which each occasionally dropping by 1p to compete with the other lol!! 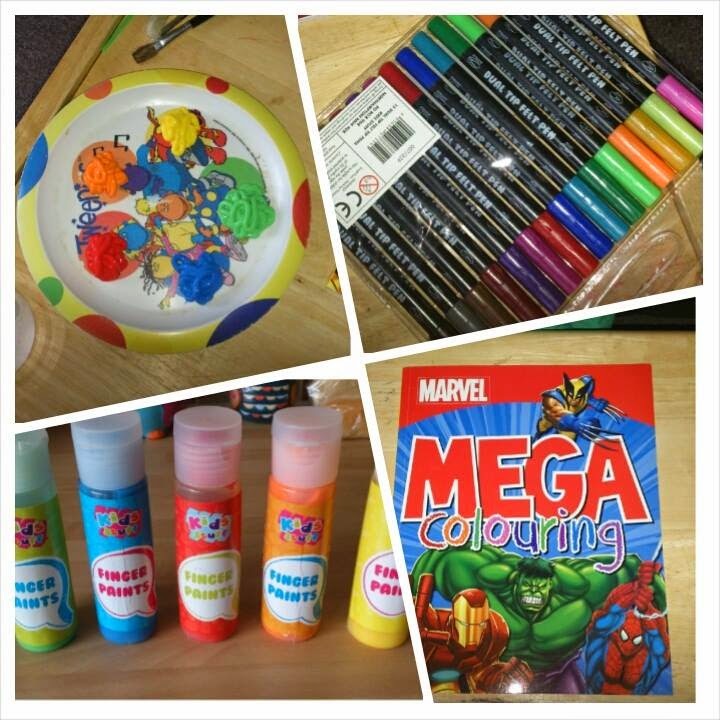 Pens, Paints and a marvel colouring book all for the grand total of.... £2.91!! 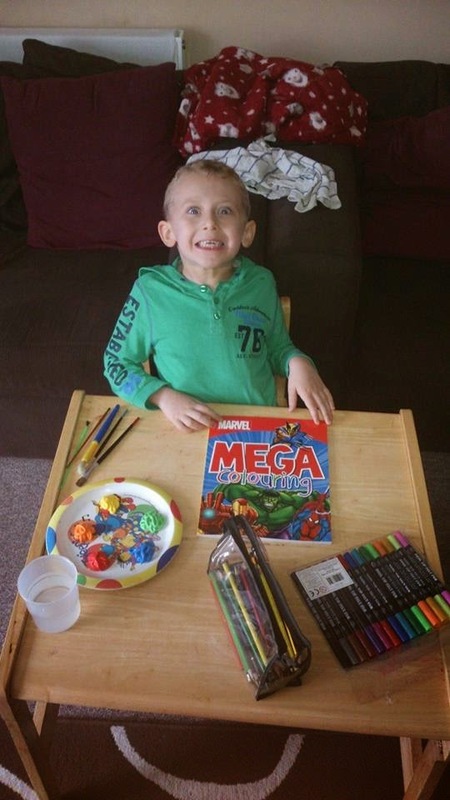 James has recently taken a keen interest in superman, spider-man, batman and all the superheroes so the colouring book was a great find! James has been quite happily playing with these for the last hour with no signs of getting bored (this is a real result considering the words sitting and still rarely feature in a sentence that starts with James lol!). I think someones happy lol!! This half term we really haven't spent that much money and James hasn't moaned he has been bored once! I always worry about half terms and summer holidays as to whether im keeping him entertained enough but it just goes to show you really don't have to spend that much to please a child lol! How do you keep the kids entertained when their off school or nursery on a budget? Please do share your tips and ideas below I would love to read them! Thank you for sharing, I think this is going to be an insanity saver for many parents who are stretched too thin budget-wise. Kudos for keeping James away from boredom! I rarely visit the pound shops here, but I think perhaps I should - we home educate and it would be a great way to get cheap craft resources. Fab! £ shops are great for half term ideas! We have been building dens (out of sheets and blankets) and baking this time round. Starting to dread the summer holidays lol! My two have been going mad this week been stuck in with this bad weather - I am taking them to the park this afternoon whether they like it or not! We have that colouring book and it has been one of the best buys, my son loves it! That's amazing that you picked all of that up for under £3 - mine would absolutely love a craft day with those. I can remember how hard it is being pregnant with another to entertain - sounds like you've all had a lovely time though. Good luck for the last few weeks! It sounds like you're having a lovely week. We were having a quiet day at home yesterday and my son (age 11) decided he wanted to make a fire outside. He found some dry sticks and newspaper, built a fire and I supervised while he lit it. He was so pleased with himself! Great post, it's easy to get caught up in a school holiday spending spree, but it really isn't necessary all the time. I went to our local pound shop at the beginning of the hols. I spent £9 and got LOADS of stuff. Pavement chalk, googly eyes, glue, paper, pipe cleaners, crafty foam...we've been making things all week! It's a shame the weather has been so poor as normally we spend lots of time at the park, I'm also dreading the school holidays! We end up doing a lot cooking and baking during the school holidays if we can't get out and about. The girls love making cakes and pizzas or doing a Come Dine With Me competition where they each make a course for a 3 course meal then vote a winner! Part or all of this post was stolen by the blogger at benaffleckbatman.net. He did it to me too (and several others as well.) His blog needs to be taken down! As of today, I have been unable to contact him. Perhaps you will have better luck. Just thought you should know that someone is stealing from you. He seems to steal anything Batman related. Blessings as you welcome soon your new baby! I have lots of post if you search under bored jar or bucket list. Colouring and baking and minecraft here!